In case you missed it, earlier today NASA tried to launch a suborbital rocket carrying two hypersonic experiments. 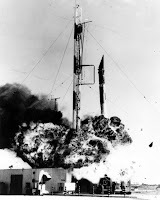 Less than 30 seconds into the launch, range safety officials opted to abandon the mission and destroy the rocket. According to a NASA press release, "(most) debris from the rocket is thought to have fallen in the Atlantic Ocean. However, there are conflicting reports of debris being sighted on land. This debris could be hazardous. People who think they may have encountered rocket debris are advised not to touch it and to report it to the Wallops Emergency Operations Center at 757-824-1300." In the spirit of failed missions to outerr space, Wired Science has posted 5 of the worst space launches. Happy reading!